Start Pac® Model 53050 is a 28.5 Volt continuous DC portable power supply when plugged into 110/220 Volt single phase AC power. This unit will deliver full 50 amp DC output continuously, but will not provide enough current for aircraft engine starting or mining equipment starting. This unit is designed to power up various systems such as programming GPS and avionics and is also an excellent choice to power aircraft maintenance equipment. Do you need a different power supply unit? Or a gas turbine start up unit? 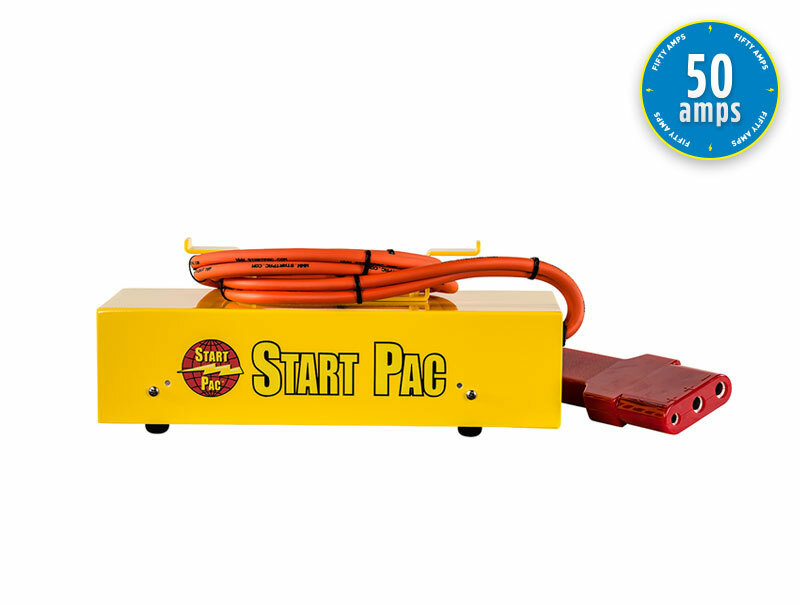 Along with the Model 53050, Start Pac also offers a large selection of other products including ground power units, starting units and portable power supplies. Whether you need a new starting unit or 28 volt power supplies, you can trust Start Pac to deliver reliable and long-lasting products. Do not cover or enclose the Start Pac® when this portable power supply is in use, as this will inhibit airflow needed for cooling purposes. Use a minimum of 12# wire size for the AC extension cord.